Celebration: The week started with us celebrating Princess’s (10) Christian birthday. As a family, we love celebrating and we love celebrating important events in our life. Amongst the events we celebrate is the date of when each child made a decision for themselves to be a follower of Jesus Christ. We believe that this decision has life long implications for each person. Growing up, there were several times when I actually doubted that I had become a follower of Christ. Thus, we decided as a family to celebrate each person’s decision so that there would never be any doubt that they had become a Christian. This still gives them the freedom to make further decisions to deepen their relationship with Jesus Christ. 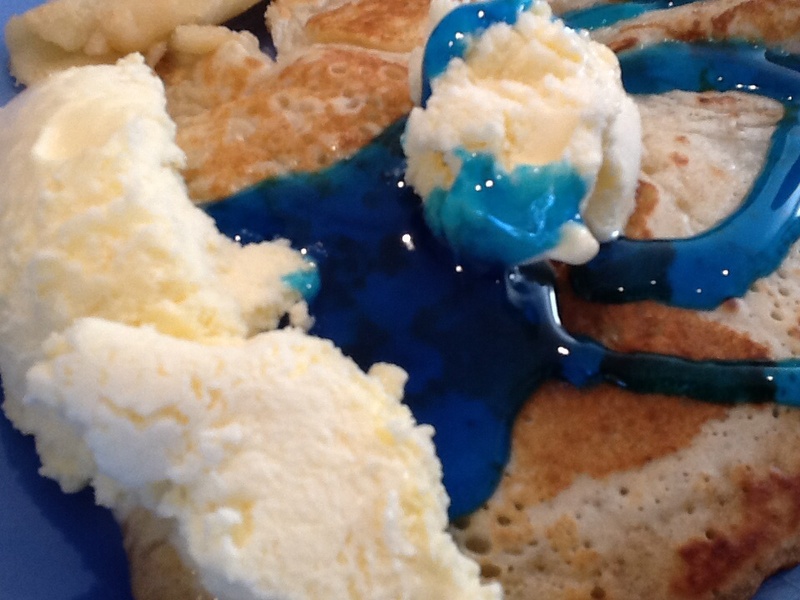 Part of the celebration is having pancakes with Ice-cream for breakfast and having a special evening meal as well. Plus, Princess had chosen a new Bible as her special present, something she had been waiting for. Dicecapades: Our local shopping centre has had a number of shops close down lately, including our favourite games shop. Whilst it is sad and inconvenient to see the shop go, it has been great for us to purchase a number of new board games all at a fraction of the normal price. 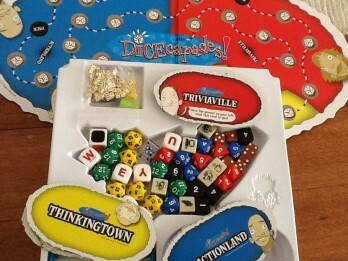 One of these games is “Dicecapades”. 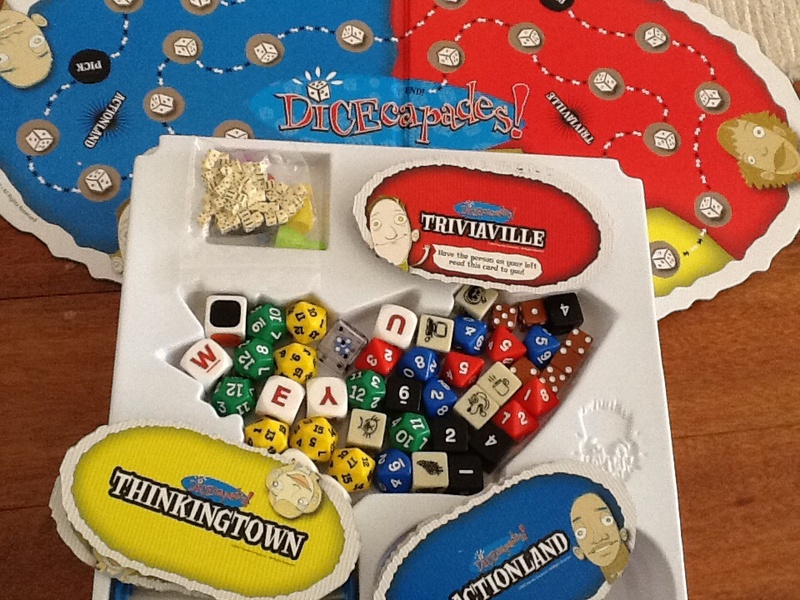 The game has over 100 assorted dice including number dice, colour dice, letter dice, and dice with pictures on them. The object is to be the first person to move all the way around the board. You can only move your counter after you have correctly answered or achieved the task you were set. There are trivia questions, tasks to do eg stack 10 dice on top of one another in 5 seconds, and thinking questions eg make 5 words with the letters rolled. This game is a lot of fun to play, as well as being quite quick, so was a huge winner. It also had very achievable tasks for our 8 year old son to do, so an all-round favourite game. Mum-daughter time: With the promotions that the shopping centre has started to entice shoppers back, Princess and I were able to have our fingernails painted for free as well as having a free clothes stylist session each. I was initially hesistant since Princess is only 10 years old, but very fashion aware, so we went ahead and had a great time together with the lady. It was a great encouragement for Princess about what colours suited her and the style of clothes to suit her tall, athletic trim body – all of which she already had a good idea of. The main new advice was which shops to find which sort of clothes in and how to shop smartly with waiting for bargains, keeping track of their sales etc. Also, advice was given about what clothes and accessories it is generally wise to spend more money on and which accessories to buy cheaply. Thus, we had a very enjoyable afternoon together doing ‘girlie’ stuff that we wouldn’t normally do. Healing Rooms: Our family is involved once per month on the Healing Rooms team at Church. Saturday was a great time of seeing people healed and changed. Princess is really starting to get involved well, choosing a team leader each time who will really mentor and encourage her in this. It has been exciting to see her development in this area. Often she will draw a picture for the person being prayed for, a picture that speaks into that person’s future or about that person’s healing. She was greatly encouraged on Saturday as she had just drawn a picture of this lady’s feet dancing in a meadow when the team leader shared, having no idea what Princess had just drawn, that very same picture. Intrinsic vs Extrinsic motivation: One of the areas I need to look at in the next little while is how to get my children to go from extrinsic motivation in certain areas, to intrinsic motivation. I realise that part of it is a maturity thing as well. It was a classic at Princess’ swimming race night on Sunday night. She had just turned at the 25m mark, and realised that she could win and also get a personal best (PB) record if she hurried so she suddenly motored ahead. She then shared with hubby what had happened since everyone was commenting on how she had flown ahead all of a sudden. Hubby had apparently promised pizza for dinner if she obtained PB’s in all her races, which she did. Pizza is one of her favourite meals and it was apparently enough to extrinsically motivate her at that time. I can’t wait for the time when she will race her hardest for the sake of doing her best, rather than for pizza!! If anyone has any advice for me about converting extrinsic motivation to intrinsic motivation, I would love to hear it. Princess is 10 and Matey is 8 years old. Please feel free to comment below. Pizza is not a bad extrinsic motivation … a lot like us doing work for money but I guess the key is to find what intrinsically motivates us for the love of it and then hopefully earning money from it??? If we are very fortunate??? I think we all need both … forms of motivation … but perhaps its teaching them to reward themselves with small things for goals achieved after goals being set? Excellence for the sake of excellence is the goal … we shine because it is who we are and whose we are … but the trick is not striving, but extending … some would say that is mere semantics, but I am hoping it goes deeper than just using different words. Also loved the shopping idea. I have been training my two since they were little about cut, cost, choice, use of money … value at a good price vs cheap buys and many items … all things I wish had been taught early and young … including colour!